The origin of mold design and moldmaking in the U.S. is traceable to metal stamping die makers, rubber moldmakers and die cast die makers. Early pioneers in plastics went to these established tradesmen because of their history in designing and building tools for production, the preciseness of workmanship as well as familiarity with 2-D and 3-D shapes. Unfortunately the majority of molds designed and built today have not evolved much since those very early practices. Most designs fail to truly consider the dynamics of the molding process. Because of the lack of willingness and insight to change, tool steels are the most widely used and accepted materials for cores and cavities. While tool steels do have a place in designs, there is a tendency to overuse tool steel, which in effect sacrifices mold performance. Oftentimes the only design and build criteria given is to construct a device just adequate enough to make an acceptable plastic part. Production efficiency is not always a factor of importance. Long gone in profitable molding operations are molding machines with magnetic relays, mechanical timers, manually set limit switches that controlled machine motion and would only do one action at a time. Combine the molding machines available today with plastic resins and support equipment, and it is obvious that the mold is now the weakest link in the profit chain. The mold is all too often the limiting factor in the molding process. It is hard to believe that there are a significant number of molders, mold designers and builders that continue to follow stagnant or outdated designs, for some very irrational reasons. It is only in the last few years that processors are finally placing expectations on mold builders to meet minimum or guaranteed mold cycle times. Where do mold designers and moldmakers look for answers? When mold designers, moldmakers or plastics processors are conceptualizing, initiating or committing to paper a mold design, there is little if any integration of copper alloys as major plastic forming steel. The absence of copper alloys in a mold is the result of ignorance, fear, misconception, some prior bad experience or misinformation. The presence of copper alloys in a mold and the extent of that usage merely means that at least someone in the design chain had some awareness and understanding of the benefits of using those materials. The extent of copper alloy use, the success of its application as well as the life of those components will ultimately be determined by the selected alloy in combination with the design of the application. In reference to high conductivity copper alloys, there needs to be clarification of products that are best suited for molding applications. The use of the term high conductivity here references products with at least 60 BTUs/sqft/ft/°F of thermal conductivity. Copper alloys with lower conductivity do have applications in molds, but not as plastic forming surfaces. Relative to conductivity, there are hundreds of copper alloys produced throughout the world. It is important to recognize that among the various copper alloys, thermal as well as the relative electrical conductivity, can vary to extremes depending on the product designation. This variance also can be prevalent with the same alloy designation coming from different suppliers/producers. This is because there are subtle variances in the equipment that manufacturers use. There also can be variances in the quality of feedstock used to make the alloys. The best alloys available for thermal conductivity as well as for overall performance in molds are all virgin materials for feedstockno back scrap or reprocessed elements in the chemistry. Testing at Western Michigan University concluded that 90 percent of the heat removed from a molded part occurs from contact of the plastic resin with the core surfaces of the mold. This of course means that the cavity surfaces have little to no influence in heat removal. This is because as the part shrinkswhich occurs fairly early in the molding cyclethe parts lose contact with the cavity surface, creating an insulating air gap. In the molding and mold building business, there are no shortages of failures and problems, regardless of the players and whether the material used for components is tool steel or a copper alloy. Generally when copper alloy components fail, it is commonplace for those involved to point at the copper alloy as the root cause of the problem. The statement If it were tool steel, this would not have happened, is all too common. This statement also is usually the furthest from the truth. Proper analysis of the failure is most often the exception, rather than the rule. Even when you believe the right people are involved in analyzing the failure. Do you have the right people looking at the problem or are the responses self-serving? Do you get the right answers, or just responses? Rather than seek out the right answer and a solution that yields the best outcome, there is misunderstanding, misinformation and rhetoric about the incident and the direction forward. If this is the case, there is little opportunity for progress and ultimate ongoing success. Molding surfaces are not always the cycle limiting factors. In some molds the cycle time can be limited by the material delivery system. This type of cycle limiting condition is present in molds where the molded part(s) have solidified enough to eject. And where some portion of the material delivery systemsuch as the main runner, sub runner or sprueis too soft and pliable to open the mold and ejects, without causing some secondary problem. These are cases in which copper alloys should be considered for insertion as the runner insert, sprue bushing or manifold plate as well as other hot runner components. Typically the basic use of high conductivity copper alloys as molding surfaces that would normally be identified as difficult to cool, result in cycle time improvements of 20 to 30 percent. By following what would be considered by most moldmakers, aggressive design concepts combined with adequate molding machining capabilities, cycle times can be reduced by 50 percent and more. With the arrival of some new copper alloys in the market place in the last three years, combined with experience and refinements in design/utilization concepts, copper alloys are finally entering a new era of acceptance. This is one of the more misunderstood and misrepresented phenomenon with copper alloys. Most copper alloys offering high thermal conductivity, high mechanical strength and hardness are from a family of metals considered to be precipitation hardening materials. Another term used to define this heat treatment is an aging process. The specific aging processes are based on the copper alloy chemistry, which when aged in a controlled environment, determines the alloy hardness. In addition to affecting the chemical structure, the aging process also yields controlled levels of thermal and electrical conductivity. Precipitation hardening is done by heating an alloy to a specific temperature, then holding at that temperature for a predetermined period of time, then air-cooled. For stability reasons aging is done only after a solution annealing process. This means that the alloy properties are changed when exposed to time and temperature while in useby welding, surface treatments or some incident that heats the component to a temperature above the original aging temperature. Exposure to time and relative temperatures over the original aging temperature for a specific alloy can either increase or decrease the properties of the alloy. An occurrence called over aging can seriously affect the short- and long-term performance of copper alloy mold components. Over aging also can soften materials to surprisingly low levels, where the components will fail because of lack of expected hardness. Or, over aging can reduce elongation and ductility to the point where the mold component fractures because it is too brittle for an application. Copper alloys, like tool steels, provide the most desirable performance characteristics at optimum hardness rather than ultimate hardness. Some alloy manufacturers provide products at the ultimate hardness in efforts to entice buyers with the highest hardness products. While other manufacturers provide products at the optimum, which in effect allows for the slight increase in hardness and lower ductility as a result of continued aging. Providing products at the ultimate hardness is a disservice to users because the ductility of the product is lowgenerally 3 percent elongation or less, which when used in molding and exposed to ongoing time and temperature, exhibit even less ductility and eventually fail due to fracture. If someone told you that two years after running a mold 24/7, your mold components made of a copper alloychosen because it was 38-40 Rockwell Cwould start fracturing like glass, would you believe them? Those that dont soon find out that the copper alloys at 30 Rockwell C are the superior choice and will yield the longest lasting components. In other words, buyer beware of copper alloys offered at or near 40 Rockwell C. 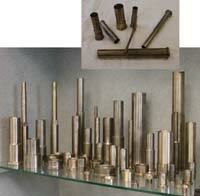 In the production of copper alloys there are either cast or wrought product forms. This refers to methods used to produce a final product, which is then machined to the desired shape by the end user. Cast products can be gravity cast, pressure cast or continuous cast. Cast materials typically exhibit characteristics unique to the process, with some similarity to wrought products. Wrought products on the other hand are hot worked to shape/form yielding performance characteristics that differ vastly from a cast product. Typically, cast products have lower ductility, are notch sensitive and can be porous. Wrought products have the most uniform grain structure and grain size, have a balanced ductility-to-hardness ratio and show much better machining characteristics. Wrought copper alloys make the best mold core making material. Cast alloys are well suited for wear plates, gibs and the like. 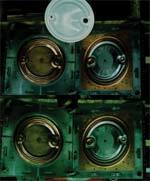 Core and cavity mold halves for a 55-gallon drum lid using Beryllium-free copper alloys. It is no secret that copper alloys are difficult to machine by conventional EDM because of the thermal and electrical conductivity. What makes it a great mold core material, makes it a lousy EDM workpiece. The high conductivity characteristics defeat the EDM metal removal process. Most EDM tool manufacturers and electrode manufacturers seem to take the position that there is no real way to improve. On the other hand, there are EDM tools being made with linear motion systems and control technology that appear to address the slow metal removal rates, high electrode wear rates and the potential for DC arcing. Check out EDM dealers or EDM houses that have linear drive axis machines. There always is concern for wear of molding surfaces when abrasive resins are being used. Abrasive resins are most damaging at the area opposite the gate and on low or no draft surfaces. The area opposite the gate is exposed to tremendous velocities and volumes of resin, so replaceable hardened wear inserts should be part of the mold design. As far as no or low draft wall surfaces, filled resins are most abrasive when the resin is solidified upon part ejection. Generous draft angles on part walls will reduce or eliminate wear caused by part ejection. When a mold design requires that a heated gate drop be integrated into a molding detail, there must be a bushing designed around the drop. The bushing must be made using a low conductivity material such as stainless steel. Also, relieve the diameter of the bushing at non-critical fit points to further insulate the drop. If this bushing design is not utilized, the heater element in the drop will work to overcome the cooling effect of the molding detail, which in effect, will actually cause the plastic part to cool slower and the cycle time to be longer. Do you want cheap? If that is the criteria established at the onset of a mold or molding project, the results are going to be questionable, even downright bad. The fact is there are limited ways for molds to become cheap or competitively priced. Elimination of steps in machining processes such as hard machining has become the norm in moldmaking todayin addition to unattended machine operations and subcontracting work to supply partners using specialized machines, talents or automated facilities that a primary moldmaker may not have or in which to invest. This is a huge cost savings. High conductivity copper alloys are all offered at what is described as the usable hardness of the product, so hard machining is a given. The next criteria of cost reduction then becomes using designs that do not over use more expensive materials, which copper alloys tend to be when compared to tool steels. Oftentimes, rather than making the entire core using a copper alloy, inserting portions of the mold core with high conductivity alloys will accomplish the same cycle reduction, but at a much lower net cost. Designing costs out also is why we forget about making the cavity out of copper alloys. The heat removal there is insignificant, so the return on investment or extra cost makes no practical sense. The copper alloy materials supplier must be measured and held to the same standards as you would hold a moldmaker and mold designer. If you are expecting to use a material source for design guidelines/recommendations, troubleshooting and building ongoing relations, it is important to select a supplier that is experienced with applying their products in mold applications. Be selective. Ask for and check references.